Where H is for helicopter, emphasising the H in LHD is imminent. HMAS Canberra is now due to conduct initial underway deck, embarkation and aviation support trials with ADF ground-support helicopters. In a recent Strategist post  Albert Palazzo and Antony Trentini advocated the use of SH-60 Romeo helicopters from the LHDs for anti-submarine warfare, in a new tasking to complement the oft-stated amphibious and humanitarian operations. Their welcome piece expands thinking of the LHDs in a strategic light, but includes yet another ‘swing’ at possible F-35B operations from the LHDs. I hope this follow-up helps add some light to this new strand in ASPI’s LHD discussions. The LHDs are not LHDs. They’re ‘strategic projection ships’, a clunky term admittedly that doesn’t much help describe their full capabilities. In plain English, they’re better described as multi-role flat-tops. LHD is an obsolescent and single-role label that’s used for easy signage, but does not indicate the possible air-power capabilities Australia has to hand with these ships. Rotary ASW is certainly one of those capabilities, and the ADF already states that the Canberras will be able to support Romeos as well as the ground-support MRH-90, Chinook and Tiger aircraft. But as expert contributors to The Strategist have pointed out, they’re designed to accept fixed-wing aircraft—they’re not solely a ‘rotary-wing’ platform. Now to the big picture. For decades the ADF did precisely what Dr Palazzo and Mr Trentini suggest. The carrier HMAS Melbourne was primarily an ASW ship, using four generations of specialist aircraft over 25 years. Her Cold War patrols around the Pacific were strategically significant both for Australia and the alliance. However, they would not have happened without organic fast air. Not even America’s specialist Essex-class ASW carriers patrolled without air defence: by definition ASW happens nowhere near a friendly fighter base. Whereas the threats then were long-range Soviet and other hostile multi-engine aircraft, an LHD-Romeo combination with escorts in the South China or Philippine seas or Indian Ocean would also need to consider the rapidly emerging threat of carrier aircraft and long-range missiles aimed at both ship and helicopter. Far from benign, the waters of an LHD ASW patrol amid aggressor submarine and potent sir threat would be incredibly dangerous. Big ship, multi-helo ASW in distant waters is not for the faint of heart. The HMS Illustrious (pictured above) entered Sydney in 1986. The Sea King helicopters on its flight deck were outstanding ASW assets—with even better crews—and ‘Lusty’ and her sisters never departed without a full load of live ASW ammunition. The ship also carried some of the air group’s Sea Harriers. Two of the Harrier pilots at that time were Australians, as was the ship’s Principal Warfare Officer. Those fast jets were critical to the ASW mission: had the Soviets, their allies or sympathetic trouble makers struck—for real—at either the defenceless Sea Kings aloft or the ship underway, then the jets would have shot them. The point? 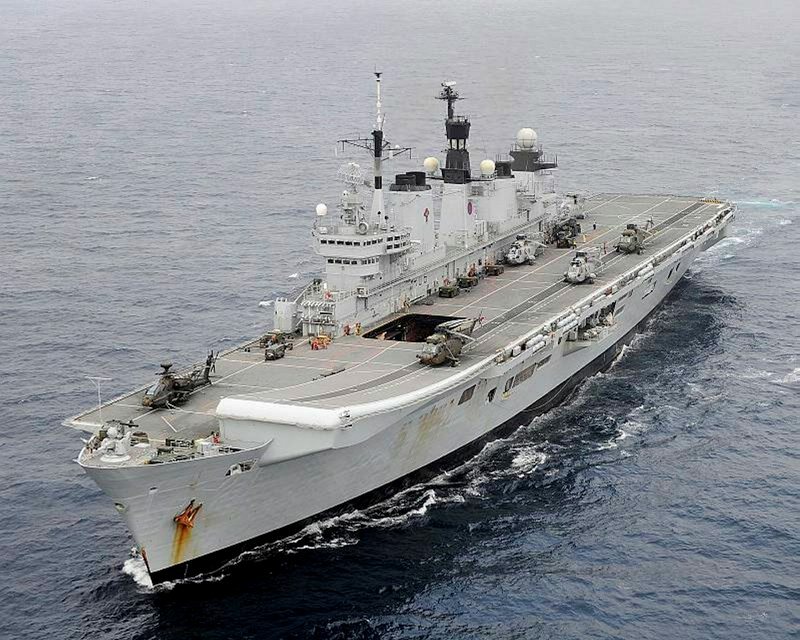 Any LHD ASW task group would require air defence, and no amount of hope and erroneously-received wisdom about Host Nation Support or in-flight refuelling will put ground-based F-35s near the ship or Romeos around the clock. Only embarked F-35s could do that. And no, ship-launched SAMs are not adequate to oppose those threats. The same air defence issues will apply to the forward use of RAAF Wedgetail, Poseidon and Triton assets from the mid 2020s. Any LHD ASW patrol would also have to fit into the broad mission profile of this fleet. That is, the LHD-Romeo idea must fit into a whole-of-ADF capability and doctrine. In an ASPI speech delivered last November, ADF chief Mark Binskin made it clear that the 1980s doctrine of Defence of Australia was destined for scrap, and that growing and long-life strategic concerns were now well and truly beyond the Imaginot Line of Australia’s top end—beyond the air-sea gap. RAAF chief Geoff Brown’s Plan Jericho, where maximum possible effect is to be extracted from networked support aircraft, fast jets and the LHDs’ own C4 capability, is a timely and critically important element of this future forward defence. LHD ASW could not be generated and evolve outside that paradigm any more than embarked F-35Bs could. Dr Palazzo and Mr Trentini have made an effective forward scout’s foray into LHD strategic potential. Using the LHDs for ASW is a valid idea for ADF examination, as most of the time the ships will not be loaded to the gunwales with soldiers and vehicles for amphibious training or cargo for disaster relief. While some hope that this year’s White Paper pushes the F-35B concept towards comprehensive analysis in the lead-up to a decision on Project AIR 6000 Phase 2C, a strong case could be made in the future for analysis of all LHD air capabilities and how they could fit into strategic planning for forward defence. That certainly includes embarked ASW. Alas, without organic and persistent fast air it wouldn’t be much of a real-world option. David Baddams was a fighter pilot in Australia and the UK from 1978 to 1999. He now works in general aviation. Image courtesy of UK Ministry of Defence .